Mikalai Charhinets (1937), Belarusian: Мікалай Чаргінец, Russian: Николай Чергинец. Having worked for the criminal service for more than 20 years and participated in the war of Afghanistan, Charhinets mostly dedicates his literary works to detective genres with the main characters coming from the militia environment and other law enforcing authorities. He wrote several novels in Russian, among them – "The Investigation Continues" (Следствие продолжается, 1977), one of the earliest detective novels about the activities of major Vetrov; "The Order Number One" (Приказ № 1,1985), dedicated to the events of the pre-revolutionary Minsk, where M. Frunze came delegated by the Bolshevik party to carry out promotional activities; "Sons" (Сыновья, 1989), about the tragic events of the War in Afghanistan, presented from the point of view of young soldiers, as well as their parents, or even Afghanistan inhabitants; "The Mystery of the Oval Office" (Тайна овального кабинета, 2002), the storyline of which unfolds in Washington City, within its highest government circles; "You Have a Mission" (Вам - задание, 2004) – about the activities of militia in the war time, and other works. The former senator and writer Mikalai Charhinets has commented on the fact that a deputy contender Yauhen Lipkovich and his accomplices made a bonfire of his books in Sevastopol Park in Minsk on Sunday. “I have never heard of this deputy contender, - claimed Mikalai Charhinets in an interview with ERB. – However, he is guaranteed to be rejected by electors when they get to know about the incident. Nevertheless, my books have always been among the most read ones”. According to the writer, if the blogger felt warm near the bonfire of his books, his heart will not be warmed by the action. At the same time, Charhinets is not going to sue Lipkovich for “the barbarous act”. I would like to add some more detail about the author. 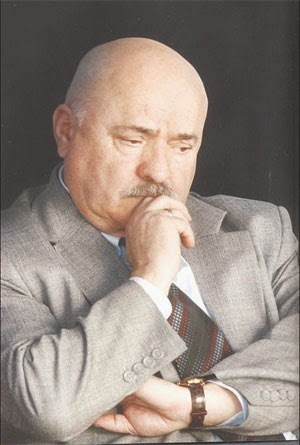 Николай Иванович Чергинец was born to a blue-collar worker family in Minsk. He graduated from a high school as a trainer. He has played football for clubs like: Spartacus (Minsk), Locomotive (Vinnitsa), Moldova (Kishinev), Harvest (Minsk) and SKA (Minsk). Nikolaj worked as head of the Criminal Investigation Department of the Ministry of Interior of the BSSR. He served 3 years in Afghanistan. Thanks to all the hard work he has done, he has received Order of the Red Banner what was the first and also the highest military decoration in Soviet Union. Belarusian Association of Journalists reports that general and an MP Mikalai Charhinets doesn’t exclude that he may sue the media outlets that cited the arguable article “General–Senator Mikalai Charhinets” by Alaksandr Tamkovich in their publications. He made the statement during his press-conference on January 3, 2008. M. Charhinets showed a large pile of printouts from the Internet and copies of publications, where journalists cited different parts of the article. The politician believes some statements in the press, related to the claim, may deserve separate trials. However, reportedly, he hasn’t addressed to the court yet and made up his mind to keep and eye on the press in the meantime. The Council of Morality led by chairman of the Union of Writers of Belarus plans to give more attention to organizers of concerts of such bands like Marilyn Manson. The band, which is considered to be one of the most scandalous groups of nowadays, is expected to play a gig at Minsk's Palace of Sport on December 22. This is the day of apocalypse according to the Mayan calender, which possibly became a reason for the increased attention of elderly guardians of morality. They have been trying to ban the concert since summer, Narodnaya Volya newspaper reports. “I have seen too many cruel murders, such as rapes and murders of 4-5 year-old girls, corpse dissections,” Charhinets said. “I would keep [this punishment] for this category. If we won’t response to such crimes harshly, they would grow. I won’t use capital punishment to any economic crimes… I would keep it only for one crime, for abuse and cruel murders of children, as not a single mother would find a justification to a murderer”. -The politician, general Mikalai Charhinets (Cherginets) has expressed his opinion on demands of the Council of Europe to the Belarusian authorities.